Hello folk fans! Kurtis from Covering the Mouse here, for one more guest post before the end of 2007! This time, I’m taking a break from Disney but sticking with a cartoon theme. Folk covers of cartoon Christmas songs! One of my favourite parts of the holiday season are the Christmas television specials. I love them. A Charlie Brown Christmas, How The Grinch Stole Christmas, A Garfield Christmas, A He-Man/She-Ra Christmas Special, I love them all! Pioneering the Christmas special tradition was a small animation company called Rankin/Bass who specialized in stop-motion animation. I will be focusing on these specials today. 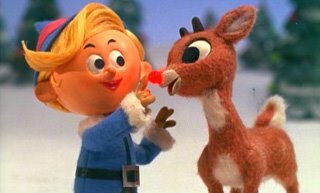 Rankin/Bass’ first Christmas special was an adaptation of the famous Christmas song Rudolph the Red-Nosed Reindeer in 1964. Originally by Johnny Marks, this cover is by the famous Canadian children’s folk singer, Raffi. 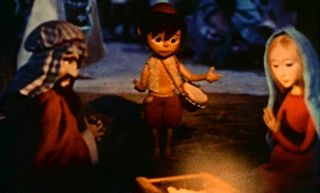 In 1968, Rankin/Bass produced their second stop-motion animated Christmas special, this time based on the popular song, Little Drummer Boy, which was originally written by Katherine K. Davis and popularized by the Vienna Boys Choir. More recently, David Bowie and Bing Crosby sang a duet that has become a Christmas standard. This cover of the song by Johnny Cash actually came out in 1959, a decade before the TV special. The last special I will be covering today is Frosty the Snowman. The song was written for Gene Autry after he recorded a version of Rudolph that sold millions. 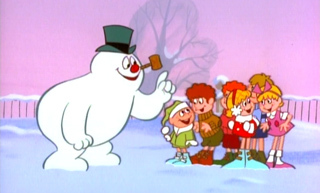 In 1969, Rankin/Bass created a new story around Frosty that tied him into the Christmas holiday. The unique thing about this special is that it is done in the traditional cel animated style instead of stop-motion animation. This version comes from 2005 alt-rock compilation Christmas Calling. Along with cartoons, I’m also a big fan of the Muppets! Here are a few tracks from the Christmas album they did with Folk legend John Denver!